About one million Fieldfares migrate to Britain for the winter, quitting their Fennoscandian breeding areas as the rowan crop runs out (BTO Winter Atlas). The Atlas map shows that they are widespread in Cheshire and Wirral, and altitude is no bar to them, but urban development obviously is. 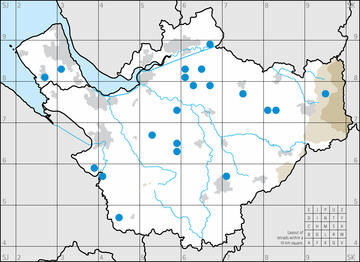 They were absent from most of Halton and Warrington in SJ58 and SJ68/ 69, the east Wirral and more local gaps including the Stanlow industrial complex (SJ47D & SJ47I), and parts of Chester and Northwich; in only eight tetrads were birds recorded with a habitat code of urban human sites (F1). Fieldfares are also scarce on Hilbre, which appears with a dot on this map because of just one bird in the last year of this survey. These are gregarious birds, most Fieldfares breeding in colonies and usually being found in winter in flocks, often mixed with Redwings and Starlings, and sometimes amongst Lapwings and Golden Plovers. Even in relative safety amidst their large flocks, Fieldfares are wary, and often fly into the top of a tall tree, all sitting prominently, facing into the wind. Apart from such occasions, however, this is the wintering thrush least likely to be found in woodland (10% of habitat records) or human sites (7%), and the habitat records came overwhelmingly from farmland (78%), mostly improved grassland (34%) and tall hedges (18%). In fields they take about half of their food from the surface, mainly beetles, spiders and flies, digging the rest from the soil including earthworms, centipedes, slugs and larvae of beetles and craneflies. Atlas fieldworkers reported them on maize stubble (particularly favouring recently slurried areas), flooded meadows, and pastures, often alongside sheep or horses. In the hedges, their staple diet is haws, hips, ivy and holly, and, if they can find them, the protein-rich fruits of mistletoe, juniper, rowan and buckthorn (Snow & Snow 1988). In hard weather they resort to commercial orchards, often in large flocks, to feed on apples, especially favouring the sweeter, softer varieties like Golden Delicious; one or two apples are sufficient to sustain them through a day of hard weather when the ground is frozen, although they will lose condition after a few days without invertebrate food or more nutritious hedgerow fruits (Norman 1995). In prolonged spells of sub-zero temperatures, many Fieldfares leave the county, but conditions since the 1980s have never been severe enough to provoke their departure. Most surveyors counted their Fieldfares, providing 771 counts over the three years of the Atlas survey. Although Bell (1962) wrote that they were more numerous in some years than others, there was no evidence for this during the three winters of this Atlas, in contrast to the results for Redwings. 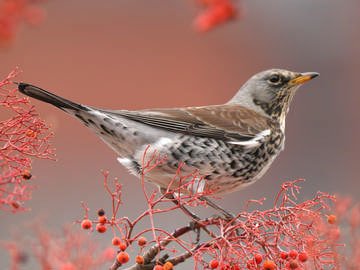 Counts of Fieldfares were submitted from almost identical numbers of tetrads in each year, and the median flock size each winter was the same: 50 birds. There were twenty-six records of large flocks of 500 or more, headed by the 2,000 reported by Charles Hull in SJ65H and the 1,392 laboriously counted by John Bannon just before the end of this Atlas period (26 February 2007) on grazing pasture near No Mans Heath (SJ54E). Fieldfare roosts are often not as obvious as those of other thrushes, so it was good that they were reported in twenty tetrads, holding from three birds to more than 1,000, in habitats including willows and rhododendron scrub in a large garden. Most Fieldfare roosts are low down, often on the ground (Norman 1994), but nine of those reported were shared with Redwings.